City councillors have pencilled in water rate increases of 8 per cent a year for three years starting in 2015 to raise money for repairs. The city needs to increase water rates to help pay for infrastructure repairs, some councillors say. Toronto water rates need to keep rising, city councillors say. A previous decision to increase rates 9 per cent annually for nine years comes to an end in 2014, but now it’s being proposed to continue with 8 per cent hikes taking place in 2015, 2016 and 2017. Once the final nine per cent hike is added next year, the average residential customer using 300 cubic metres annually will pay $887. If city council follows up with 8 per cent increases, the average bill will climb to more than $1,100 by 2017. 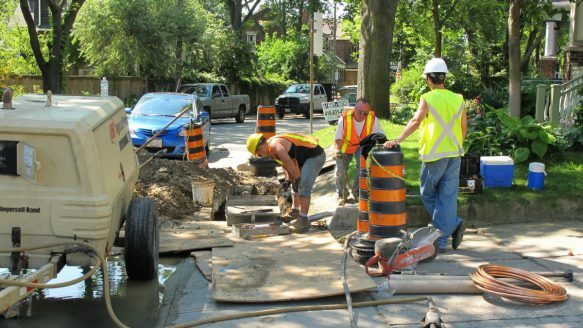 Between now and 2023, Toronto needs to do almost $1 billion of work that is not currently funded, said Toronto Water general manager Lou Di Gironimo. The rate increases are needed to generate funds to upgrade stormwater runoff capacity and thus prevent flooded basements during heavy storms, Di Gironimo told the budget committee. While the city has upgraded storm sewers in a number of neighbourhoods, it needs to do more, Di Gironimo said. “What we’ve done so far — the 9 per cent — is not enough,” said Councillor Gary Crawford (Ward 36, Scarborough Southwest), whose area was hit by basement flooding in 2012. “We need an extra $1 billion to $2 billion to deal with these issues and I think that’s the commitment that we need to make as a council and I think we will be making as a council,” Crawford said. By signaling it is prepared to hike rates, water officials can begin to plan and design repairs and upgrades, said Councillor Gord Perks. “We’ve told the staff, ‘Act as if we’re going to increase the water rate by 8 per cent so that you can get enough repair work studied, engineered and ready to go,” Perks added. Water rates are set year by year as part of approving the water department’s annual operating and capital budgets. So while 8 per cent has been pencilled in for 2015, it’s a guideline only at this point. “In January, 2015, we might not pass 8 per cent,” Perks said. “We might pass 6 per cent plus a storm water runoff charge. We might decide to borrow money. Those decisions will be made then.